↓Season 42 The club was formed on the 15th of June 2010, from the ashes of chodelets, joining mid way through season 42. United (Chodelets) had already been eliminated from the cup, so manager Politzia only had the league to focus on. United only had five matches remaining, and Politzia managed to steered them to a decent 5th place. ↓Season 43 was planned as a season of development with the manager wishing to strengthen his team. United made it to round 2 in the cup before being knocked out, and achieved a comfortable 4th place in the league. ↓Season 44 was again about strengthening the team, but this time Politzia was wanting his squad to push for a top 2 spot. Once again United crashed out of the cup in round 2, but their season was far from over, three matches from the end of the season, United were sitting 2nd in the league. United lost 1-0 to Roonited Nations, who moved up to 2nd, they then played 1st placed Transform FC, losing 2-0, destroying all hopes of a 2nd place finish. They won their final match 1-0 to secure 3rd place but after being 2nd for most of the season, it seemed like a bit of an anticlimax. 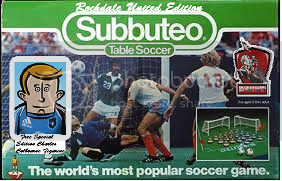 ↓Season 45 Rochdale United maintained competitive for the first half of the season spending their time sitting 2nd in the league, with only goal difference separating them from leaders Transform FC, United unfortunately started slipping, and by the end of the season they finished 3 points behind Transform in second place. They have however been knocked out once again in the 2nd round of the cup. ↓Season 46 saw Transform FC go into administration, and was shut down, Wardys Wombles replaced them, and faced United in the first match of the season. United took this opportunity of upheaval to set about getting themselve into a strong position from the off, resulting in what turned out to be a comfortable 9-0 victory. United went from strength to strength, going on a thirteen match winning streak in the league. United wrapped up the title with a match to spare, and only needed a victory in the final match to guarantee automatic promotion. United faced Wierd Eleven in the final match, the newcomers had joined mid season, but were out to claim a scalp, which they managed, winning 3-2, after going 3 goals up. United tried a fightback, with Walter Neff, scoring a double on 76 and 79 minutes, but it was just to far a target, and United succumed to their first loss of the season. ↓Season 47 Saw United installed as favourites,and they started off strongly against a Roonited Nations side, winning 4-0. This was to set the precedent for the remainder of the season, with United winning all 14 matches, to guarantee auto promotion. United even got revenge over Wierd Eleven, thumping them 7-0 at home, and 5-1 away. United put away 109 goals and conceeded a solitary 1, to march into series V.175. ↓Season 48 Was a season of lessons learnt, club overhaul and a shift you a more youthful looking squad. United started off strongly with a 0-0 draw against fellow promotee, ideal fc before a 1-0 victory over Battersea powerstations. This was however the only points United would manage to claim in the first half of the season, with them only claiming a 1-1 draw against eventual winners Ipswich FC if the second half of the season. With two matches remaining, and relegation guaranteed, the manager decided it was time for an overhaul of the squad. so starting with defence, he has brought through the next generation of players, all from the YA. The focus wll be on these players for the forseeable future. The future is already looking bright.